Choosing the right pediatric crib mattress is crucial to ensure that the baby sleeps well. Therefore, parents must never avoid aspects such as size, density, label, and hygiene when it comes to selecting the best mattress for their baby. As parents, you strive to give your child the best comfort possible. You get the best of toys and provide your kids with all the love and care. Then why compromise on the mattress to line their cribs with? After all, the right pediatric crib mattress is going to ensure that your child gets a sound and healthy sleep that will contribute to your their growth. So, here’s your guide to select the right crib mattress for your little one. Perfect fit is important. Make sure that you measure your crib properly so that your baby doesn’t wake up in the middle of the night agitated. The gaps can pose a danger as the baby’s limbs can get stuck in the gaps. Go for one that conforms to the shape of baby’s head and face so that the child remains secure in the mattress when in the crib. Go for Memory foam mattresses. There isn’t a better option for a baby’s crib than a Memory Foam Mattress which shapes itself in accordance to that shape of the baby. It is also hypoallergenic, keeping the crib rid of all the dust mites and germs. Check the quality and durability of the mattress. Earlier, crib mattresses weren’t designed to meet the quality standards and were damaged within 12-18 months of purchase. But today, there are mattresses which are designed with attention towards quality and durability and therefore, they will last you as long as other mattresses do. So, always check if the mattress meets the quality standards. Check the label. Yes, you can always look up all the information about the mattresses online. The manufacturers are required to disclose all the information by law. So, go for the mattress that has an informative label attached to it. Do the spring test. No, we are not asking you to lie on the mattress to check if its good, just push your hand into the mattress, and if it springs back up, you have found the right mattress. Seconds can be unsanitary. You always look for the healthiest possible options for your baby. Therefore, a pre-used mattress is a bad idea. 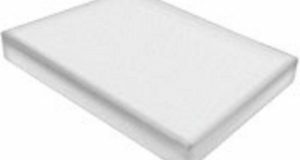 The Pediatric Crib Mattress should be bought new, as they are more clean and safe to use. Cover the mattress. Using a waterproof and soft cover not only ensures that the baby gets a dry bed to sleep on, but it also keeps the mattress free of all the germs too. Plus, mattress covers keep the mattress as good as new for long.Check the density of the mattress. Your baby needs a soft mattress to snug into, therefore, going for a high-density mattress is a big no. Buy a low-density crib mattress which is soft and easy to break into.There you have it! Now you can have your baby sleep tight and grow faster.